I’m sure most of you would agree, family life is busy. Even when we try to slow down, between our homeschool work, meals and just keeping up the house our schedule fills up pretty fast. I’m big on taking time out for crafts, ice cream dates and family dinners though. Those are the moments that we treasure as a family! There are lots of reasons why I love planning out a week’s menu in advance. I don’t buy things that will go to waste, we always have leftovers for lunch and in a pinch we can always have a few extra folks over for dinner without having to run to the store. Now I’m learning that I can also prep ingredients in advance AND use less dishes in the process. (My husband is pretty happy about that one). 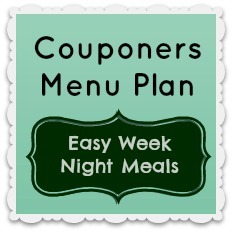 Do you have tips for how to make menu planning and weeknight meals more efficient? I’m always up for new ideas!